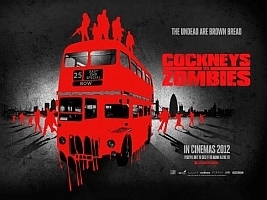 Matthias Hoene’s FrightFest opener Cockneys vs Zombies (2012) is an enjoyable, bare-faced zomventure that delivers exactly what the title promises – a fun-filled, B-movie romp with plenty of thrills, spills and jellied eels. When construction workers unwittingly unleash a horde of zombies from a tomb that has been sealed since the reign of King Charles II, the East End of London becomes overrun with the ravenous undead. The same construction company is also responsible for trying to bulldoze a retirement home which houses a shuffle of lovable cockneys, including Brit-gangster-flick staple Alan Ford and a wonderfully bumbling Richard Briar. In an attempt to save the home, the grandchildren of Ford’s character decide to rob a bank with their fellow hapless partners in crime (including former EastEnder Michelle Ryan and Harry Treadaway). However, when zombies attack, they realise they have bigger problems and must band together with the octogenarians to save their beloved ‘Landan’. Make no mistake – Hoene’s zom-com adventure is far from cutting-edge cinema. Nonetheless, the British commercial director has a great love and knowledge of the horror genre, shown in his navigation of a series of zombie-flick clichés that we’ve all seen – and enjoyed – before. Despite the notable genre tropes, Hoene still manages to keep Cockneys vs Zombies fresh, with pleasure to be taken from his understanding of British humour, pitched well throughout. This comic element of the film works well for the most part; flesh-eating football hooligans fight amongst themselves to the theme tune of Match of the Day, accompanied by so-bad-it’s-good mockney commentary. Cockneys vs Zombies’ B-movie effects provide mindless entertainment that keeps you smiling throughout, as waves of the undead are smacked about the head with whatever is to hand, or blown apart by the disturbingly large arsenal of the witless bank robbers. There is a smattering of the serious, the whole film acting as a metaphor for the gentrification of the East End that has taken place in the run up to this summer’s Olympics. It’s the lightest of treatments however, with the real fun of the movie to be found in the celebration of the quirky characters of the area. Cockneys vs Zombies is far from groundbreaking new British cinema, and we have seen similar films to this before. Fortunately, Hoene’s debut feature doesn’t aspire to be anything that it’s not. This is good, mindless fun, simply engineered for maximum giggles.